Peace Lutheran Participates is an active partner with the Neighbor for Neighbor Food Pantry in Tomah. We are always collecting non-perishable food items that are delivered weekly to the food pantry. Please place your donations in the plastic bin located next to the Welcome Table. We are always looking for volunteers to bring the collections to the pantry. If you would like to help with this local ministry, please see the pastor or Phil and Beth Stuart. 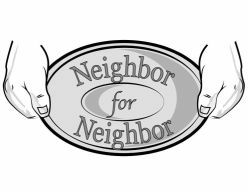 Neighbor for Neighbor, Inc. is a non-profit food pantry located and serving the needy of eastern Monroe County. Through the love and generosity of businesses, organizations, and individuals, it has been in business for over thirty years. Offer a variety of canned, fresh, and frozen food items with each visit. Solicit and receive food deemed unsaleable by retailers. Distribute large quantities of donated food product to other food pantries and other nonprofits who serve the low income population. Provide hunger education and awareness to local businesses, organizations and schools.